Oh my word, these meatballs are SO good!! I love the broccoli rabe classics – orecchiette with broccoli rabe and sausage, broccoli rabe pizza or simple sauteed with garlic and oil — but I also really love thinking out of the box to find new ways to eat it. The slightly bold, earthy flavor of broccoli rabe pairs perfectly with salty cheeses, so I knew they would be awesome in my Sunday meatballs, and I was right! Turkey meatballs are great, but once in a while I really crave a good beef meatball. To keep them light, I used leaner beef and add lots of veggies (the kids won’t know) to the meat. The key to perfect meatballs, in my opinion, is not just having the perfect ratio of cheese, meat and bread, but also gently forming the meatballs so they are not packed too tight. Rather than frying them like my in-laws do, I broil them until they get browned then let them finish cooking in the sauce in my slow cooker. The results are tender, delicious meatballs worthy of a Sunday meal. You can serve them over pasta or with Italian bread, but I love them over veggies to balance the meal and keep things light. Sure, spiralized zucchini or spaghetti squash would work, but why not serve them over more broccoli rabe – YUM! To finish it I like to add a dollop of ricotta and some grated Pecorino Romano cheese. Hope you enjoy! 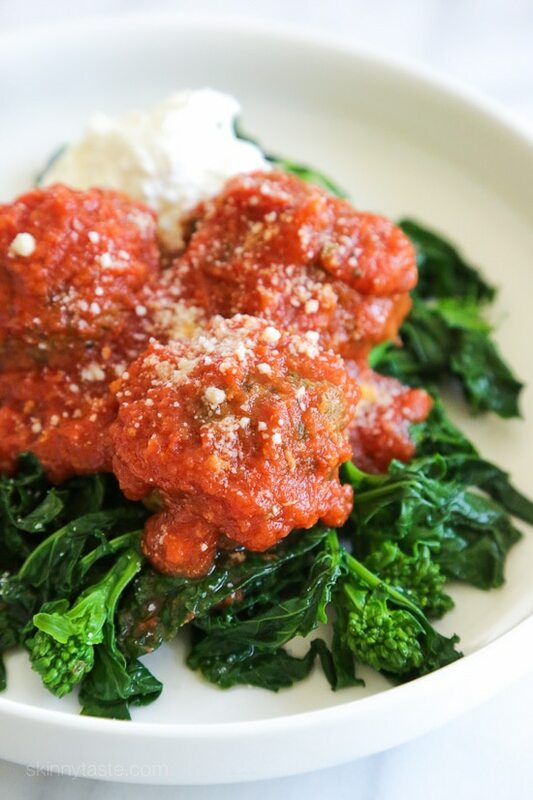 Delicious, tender, meatballs made with lean ground beef and broccoli rabe in the slow cooker. Bring a large pot of salted water to a rolling boil, then add the broccoli rabe. Blanch for about 1-1/2 to 2 minutes, drain well and set aside in a colander to cool. Finely chop 3/4 cup of the florets and leaves (3-3/4 ounces) and set the rest aside for another use (I sauteed it with garlic and oil). Meanwhile, in a medium bowl combine the bread with milk, tossing to coat. Let stand, tossing occasionally, until bread is completely moist, about 10 minutes. Squeeze bread between your fingers or mash with a spoon to make sure there are no dry spots; if there are dry spots that refuse to moisten, add more milk 1 tablespoon at a time until bread is moist throughout. 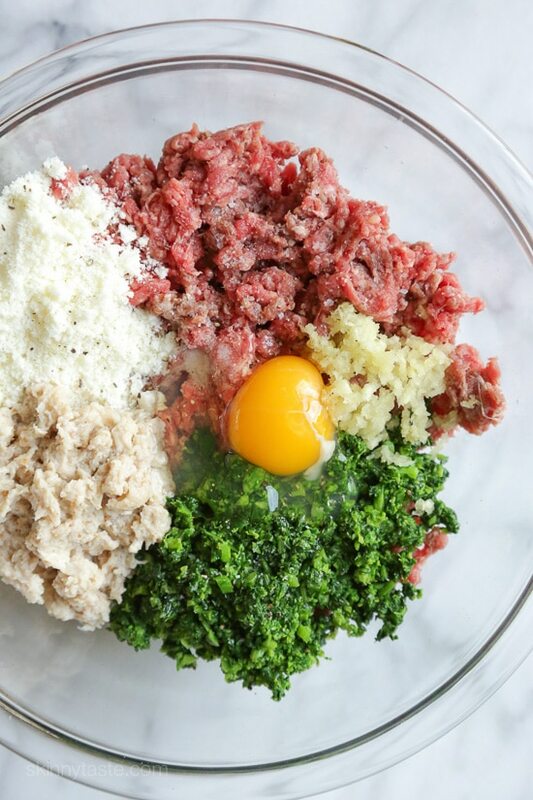 Add the ground beef, chopped broccoli rabe, grated cheese, egg, fresh garlic, salt and pepper. 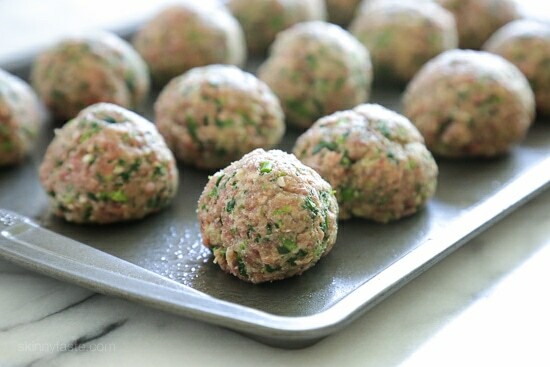 Mix with clean hands, then gently form into 15 meatballs, about 1/4 cup each and transfer to a large baking sheet. Broil on the 2nd rack from the top until the top is golden, about 8 to 10 minutes. In a small skillet heat the oil over medium heat, add the garlic and cook until golden on both sides. Pour the crushed tomatoes into a 6-quart slow cooker. Add salt and pepper, bay leaf and the garlic. Gently place the meatballs into the sauce, cover and cook low 4 to 6 hours or high 2 to 3 hours. What’s your favorite way to eat broccoli rabe? Disclosure: This recipe is in partnership with Andy Boy. Thank you for supporting the brands that make Skinnytaste possible. All thoughts are my own. Love the burgers with broccoli rabe, so I wanted to do these and we thought they were like going to a restaurant but better of course as they are healthy! I added some more herbs from my garden but otherwise made as directed. My husband said they were the best meatballs. Thank you for another wonderful recipe. I really loved this recipe, but when I put it in the recipe builder for just the Meatballs, I got 8 Freestyle points. Just wondering how mine was different from yours? 16 oz cooked 93% lean ground beef = 21 pts4 oz Kraft Parmesan Style Grated Topping, Reduced Fat = 14 pts4 slices Healthy Life Bread, 100% Whole Wheat Whole Grain = 43 tbsp Organic Valley Milk, Fat Free, Organic = 1 ptTotal = 40 pts / 5 servings = 8 Free Style pointsJust wanted to know where I went wrong here so that I don’t incorrectly track for other recipes too. Thanks! Not sure? The SmartPoints® calculator isn’t meant for recipes and will often give you the wrong points (usually higher) because it’s counting 0 points foods such as eggs, chicken, fruits and vegetables. So if you see a recipe with a SmartPoints® value that’s different from what the calculator tells you, that is why. Sure, escarole would work too. I made this exactly. They were delicious. I used broccoli because that’s what I had. I’ll be making this again. The only thing is. I only got 12 meatballs. I used a 1/4 cup measure (scant). I didn’t really matter as it’s just the 2 of us and we had leftovers. This was so delicious! I used broccolini since it was difficult to find broccoli rabe. Yummy! Can the broccoli rabe be left out or replaced with something else? Broccoli sets off my husband’s gout so I can’t include it in recipe. Is there a way to make meatballs without breadcrumbs? I had to change my lifestyle and cut out a lot of carbs to deal with a diabetes threat, but I still crave a good meatball! How many grams of saturated fat are in a serving? I’m doing weight watchers- I know you put that in is 7 smart points but when I estimate the sat fat and plug in the other factors (cal 295, Sugar 7, protwin 27) I’m getting a number much higher. Thank you! Why was my broccolini so bitter? It ruined the whole flavor of the meatballs? I followed the recipe explicitly. 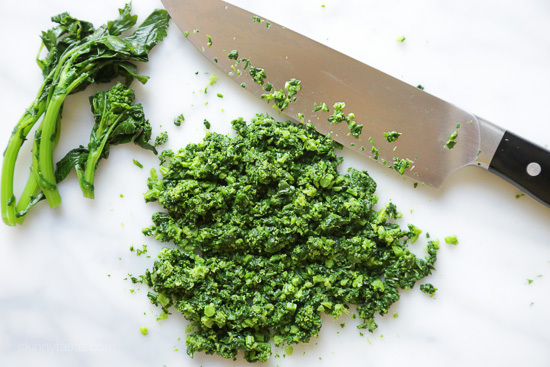 Is this the first time you had broccoli rabe? It is a little on the bitter side, although blanching it mellows that out. I just made this recipe tonight and it is literally the best thing to come out of my crockpot yet!!! Is it safe to prepare these the night before, refrigerate them and then start the crock pot the next morning? I didn’t know with the precooking. These are in my instant pot now and smell delicious! I can’t wait to eat them! Thanks for another fantastic recipe Gina! Delicious – a big hit with the family. Husband and son are not fans of broccoli rabe, so I used fresh spinach and that was fine. They are civilians (not on WW), so they had it over pasta, but I put it over zoodles for me (microwaved for a couple of minutes to soften). I had timed it for a late dinner (4 hrs on low as I have a 7 qt slow cooker and minimum times are best), but got home earlier. It had cooked on low for 3 hrs, but we turned it up to high for another 45 minutes and it turned out fine. I will make it again and double it for leftovers and the freezer. Forgot to mention that the instructions aren’t complete. After moistening the bread, it doesn’t say what to do with it. (Pic seems to show the bread with the ingredients on the plate?) I assumed that you’re supposed to mix it in with the meat and other ingredients to form the meatballs, so I did that and it seemed to work. Sorry if it was confusing, Step 3 is a continuation…”add the ground beef” (meaning to the bread mixture). Glad you enjoyed it. I had never made meatballs before, but my boyfriend loves them so I figured I’d try these. He’s not a huge fan of broccoli rabe but I am, and we both loved these! They were so delicious and the sauce was really good, too. I used almond milk because it’s what I had on hand, and it worked well. I will definitely be making these again! I made these yesterday and they are outstanding. Thanks so much again for another great recipe, can’t wait for your new cookbook! can you omit bread for gluten-free? or should I sub gluten-free breadcrumbs? 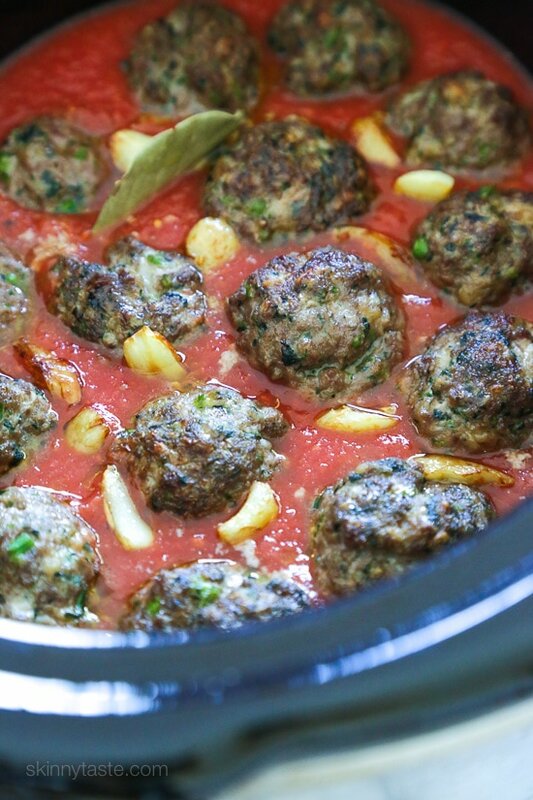 The meatballs are in the oven right now before going to the slow cooker. Oven temp 350? Best meatballs ever! So flavorful. I’ve always used breadcrumbs, but the bread soaked in milk makes them 1000x better!! My boys even loved them. Thanks! These were really good and broccoli rabe might be my new favorite vegetable. The combination of the tomatoes, the cheese, the broccoli rabe makes for an incredible taste. I made these in a cast iron dutch oven instead of a slow cooker, and turned out well. Awesome, so happy you enjoyed them as much as we did! These were wonderful. A keeper! Thanks for a great recipe! I don’t have a slow cooker, can i make this in the oven? how long should i cook it for and at what temp? Would it be okay to use broccolini? That’s all my hubby could find at the store. I wonder if the taste of the meatballs would change if I used regular broccoli,chopped up. The broccoli rabe is so expensive when I can find it. Thanks a lot. You can sub spinach too..
Love spinach.but thanks Gina…I think I’ll use broccoli (steamed) and chopped. I’ll let you know. Also so as not to bother you. Thanks a million for all you ideas. Let me know how they come out. 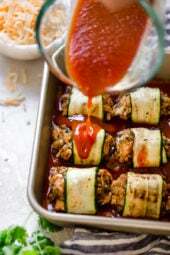 Good idea with the stuffed peppers! I love broccoli!! I never thought about adding it to meatballs, but I’m excited to try it. Thanks for the recipe!! Broccoli rabe is different from broccoli. Great idea to mix the broccoli rabe in with the meatballs! It’s a good way to get kids to eat veggies, for sure. 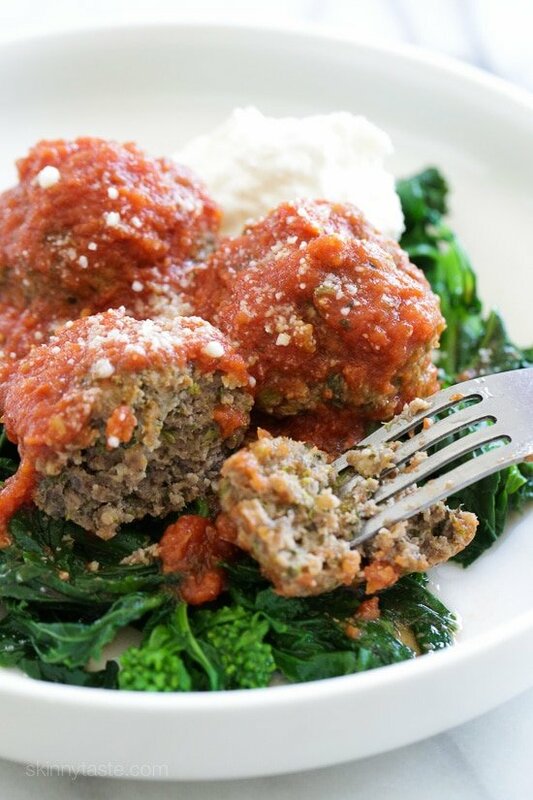 Genius idea putting that broccoli rabe right in the meatballs! This would be a perfect recipe to feed my grandson, he is not that into anything green right now haha. Thanks ! I think it’s like unpacked vs. packed brown sugar. In other words, cube the bread and put it in the measuring cup up to the one-cup mark, but don’t pack it in to get it there. Gina in your picture it looks like a lot more garlic than three cloves, did you add more? No, I smashed them with the side of my knife so they broke into pieces. Would spinach work instead of broccoli rabe? Can the meatballs be made in advance & frozen in the sauce? I would freeze the meatballs after they are cooked. If I cook these ahead of time and then freeze what should I bake them at and how long? We love these right out of the crock pot, but I’m making and freezing a big batch to take with us on a weekend away with friends. What’s the best way to re-heat so they still come out as yummy? Is the 20oz of brocoli rabe before or after you’ve trimmed off the ends? When you say unpacked whole wheat bread, do you mean unsliced? I interpret unpacked as not pushing it down into the measuring cup (like is often done with brown sugar); just place the cubes inside without compacting them. This way, you will not have as much. Don’t pack it into the measuring cup by pressing it in, if that makes sense. Great idea! 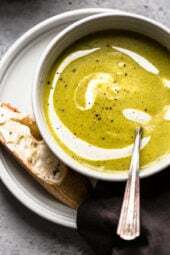 I’m making these Tn since my hubby loves broccoli rabe. Question- can you use a cup of breadcrumbs instead of soaking the bread? These look great! My question: you served it on broccoli rabe, did you use the leftover broccoli rabe you blanced to sauté in olive oil? How long do you sauté it for? I have never had broccoli rabe, so want to make sure I understand how to cook it. Thanks! Yes I used the extra which is enough to serve one, once it’s blanched I saute garlic in oil until slightly golden, then I add the broccoli rabe and salt and just cook about 1 minute so it’s heated through. Yum! Is there a way to make this in the Instant Pot rather than the slow cooker? Sure! 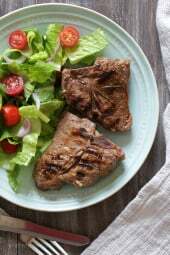 You can probably brown them with saute function and cook high 10 minutes. Sounds good, Gina, but instruction #4 isn’t complete, I think. it says in #5 to add the garlic to the tomatoes,etc……. Thank you Gina, pre- ordered your new cookbook. Happy the subject of your new book will be crockpot meals. Easy for busy people. Thank you! It’s over 55 crock pot meals, the rest of the recipes are under 30 minutes. Can you make these with ground turkey instead? I was wondering the same thing…did you try it?